The Free market Foundation of South Africa were our partners for the distribution of ideas about a free society planned for 2010. But this turned out to be bad timing for a series of intellectual seminars at universities in South Africa which could not compete with attractions of the World Cup which South Africa was hosting. So most of the events eventually happened in 2011. 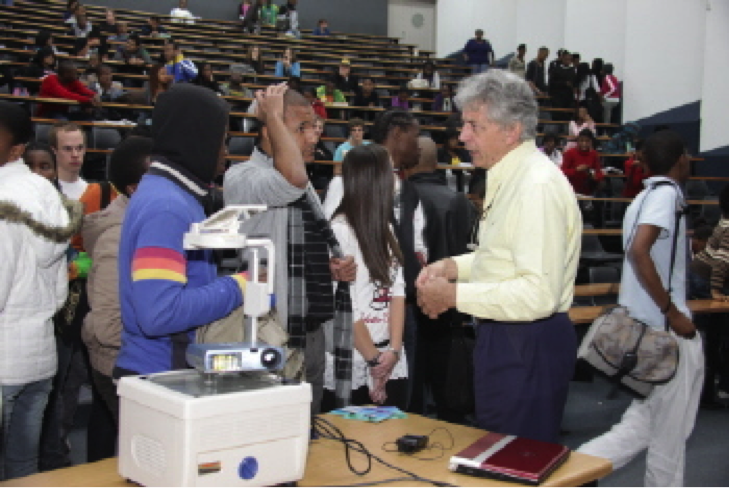 Leon Louw of the FMF made a presentation at the University of Johannesburg on May 11th, 2011. 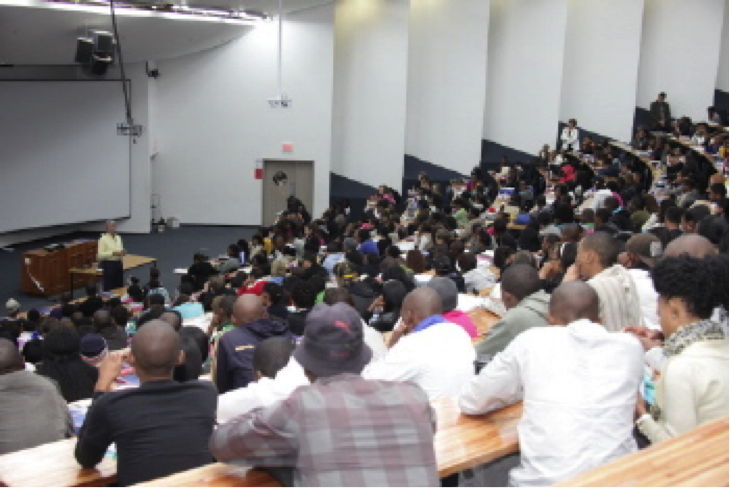 On Friday 21 May 2011 the two second year Economics classes were combined into one large assembly of over 600 students. 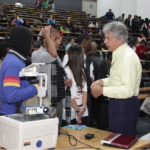 After some initial hitches with the electricity supply the learners were kept spellbound for 50 minutes by Leon Louw’s lively style and AV presentation. He explained the consent axiom and gave an outline of what they could expect from the resource disk produced by the IPN (International Policy Network) as well as other issues relating to liberty and the relationship between freedom and economic prosperity. 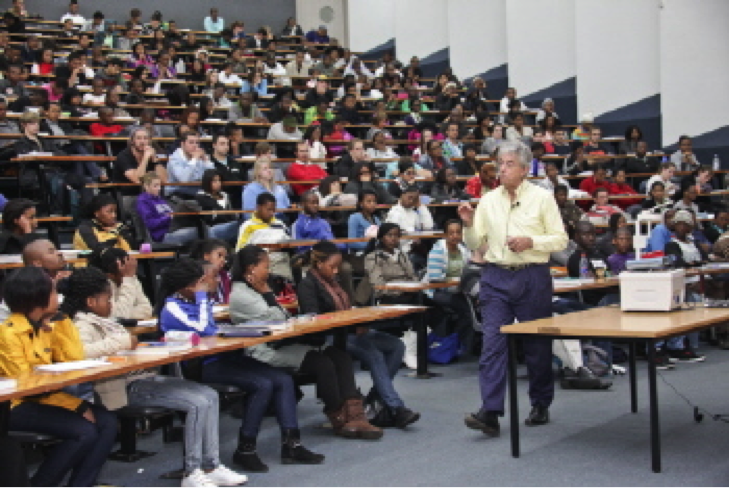 The students consisted of all race groups as one can see from the photographs taken at the event. We took some photographs before, during and after the talk. The session ended with some questions from the floor and the general conclusion that ideas matter and that individual action is key to the advocacy and general adoption of these ideas and principles. After a word of thanks from the students and from Professor Lorraine Greyling, one of the lecturers, the class ended. What was interesting was the large group of students that descended on Leon after the class eager to talk about the concepts. Professor Derrick Greyling also expressed an interest in getting additional information on the EFW (Economic Freedom of the World) report that Leon mentioned in his talk. We are especially grateful to the faculty for allowing us the time in their lecture schedule during this critical examination preparation period. 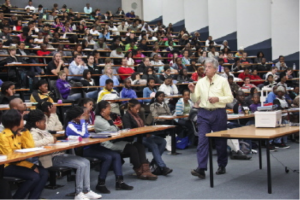 All in all 644 CDs were handed out and 390 emails were volunteered by the students for their inclusion onto the Free Market Foundation database.